The Protect My Privacy tweak, available through the usual hub known as Cydia, is a package that exists to help users protect their personal information when using their jailbroken iPhone. Since the turn of the year, we have been treated to a number of mobile app scandals surrounding apps that accesses certain information on the device without asking the user for permission before doing so. In some instances, this is a breach of Apple’s developer terms and conditions, but it is also a large breach of a user’s trust and in some instances the device owner doesn’t even know what it being accessed by the app. Protect My Privacy (PMP) is not a perfect solution by any stretch of the imagination, but it does go a long way to actually show the user what part of the device each application is attempting to access, and then offers a number of options and solutions to either prevent or allow the access. The tweak works by basically sitting in the running processes of the device and waits for an application to launch before it monitors to see what that specific app is accessing. If any information requests are intercepted, the PMP tweak offers up a standard iOS alert view with the relevant information on it. An example of this would be when launching an application that requires access to the address book on the device. PMP will produce an alert with this information and gives the options of ‘Allow’ or ‘Protect’. Certain apps actually can’t proceed if their necessary privileges are withheld, therefore if a user taps the protect option, the PMP tweak will randomize contact names and provide that information back to the requesting app to allow it to proceed further. If you decide in the future that you actually want the app to access the genuine data, switching between real and fake information can be easily achieved by using the supplied Notification Center widget that comes with PMP, and can be setup by visiting the Notifications section of the Settings app. 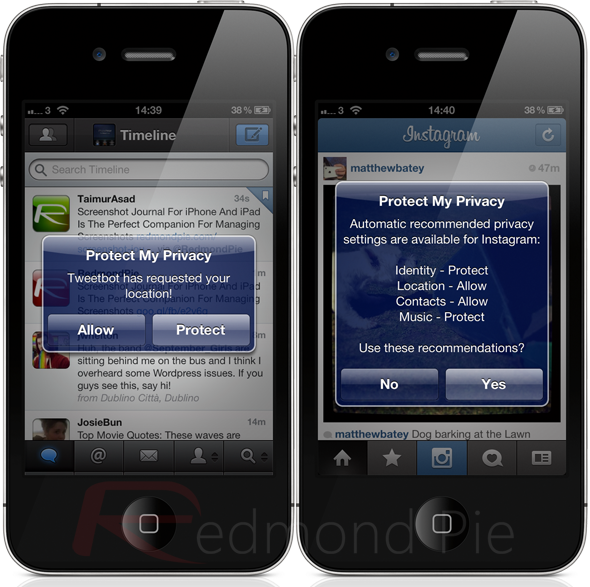 The Protect My Privacy tweak is available as a free of charge download from the BigBoss repository and requires a jailbroken device running iOS 4 or above.